The friendly staff of Best Western Plus Stovall's Inn welcomes you to the perfect vacation headquarters. Located just across the street from Disneyland® the hotel offers comfortable, updated accommodations and thoughtful amenities including shuttle service to the Disneyland® Resort, room service, free Wi-Fi, and laundry service. Enjoy the famous topiary gardens and picture area, two large pools and spas, and a children's wading pool. 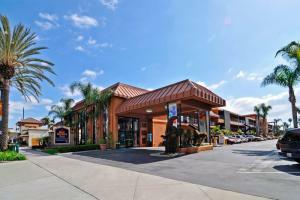 Located in Anaheim 15 miles from John Wayne Airport, and across the street from the Disneyland® resort. The restaurant adjacent to the Best Western Plus Stovall's Inn serves breakfast, lunch, and dinner. Disneyland, Disney's California Adventure, Downtown Disney, Anaheim Convention Center, Angels Stadium of Anaheim, Arrowhead Pond of Anaheim and Knotts Berry Farm.